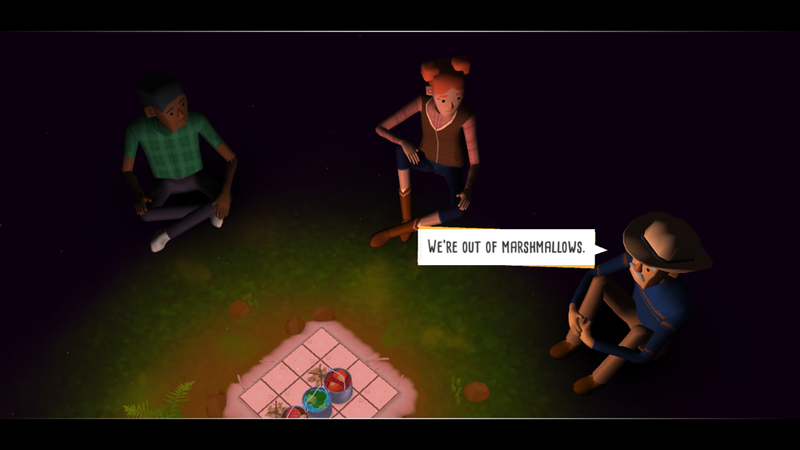 ‘Campfire Cooking’ Review: Mmm Toasty! Layton Hawkes got my attention with his first game, Puzzlepops!, an ingenious puzzler that features seemingly innocent candy that you push along tracks to goals. It was the perfect one-handed game, and I had very little to complain about. So I was thrilled when the sequel released with a Halloween theme and even trickier puzzles. Now Layton’s back with a new game that still centers around sweets (I hope he has a good dentist), but takes things away from the one-handed 2D puzzles we’re used to and towards a 3D environment that feels better on a couch than waiting for the bus. In Campfire Cooking, your main goal is to roast marshmallows so they’re perfectly toasted on each side. They’re on skewers, and you can move them in a number of ways. First, you can roll them over to the other side. So let’s say there’s two spots with fire on the grid. Rolling the marshmallow onto one will toast the side it lands on. Rolling it over onto the next flame will toast the second side. But let’s say there’s a gap between the two flames. When you roll it onto the second flame, it will land on the first side again, burning it. So in those instances, you need to find a different way to move the marshmallow and get both sides evenly toasted. So you learn that you can also push the skewer up, keeping the marshmallow on the same side instead of rolling it over. 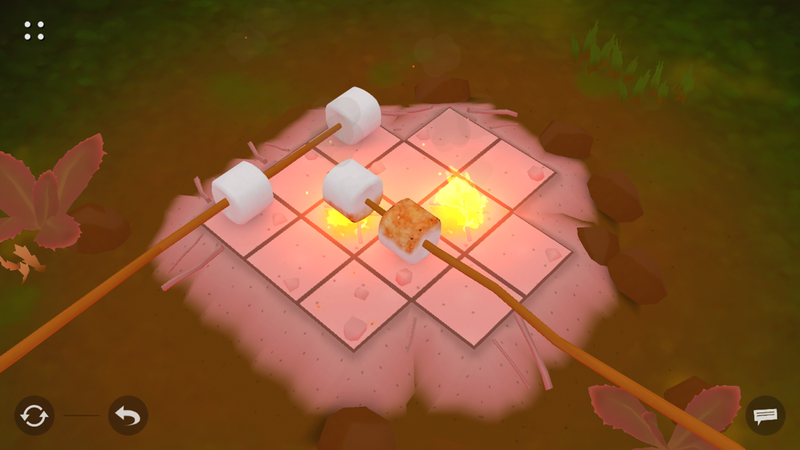 It also turns out that you can push one skewer with another, and the marshmallow doesn’t turn over in those instances. This is a technique that you’ll be using a lot, but knowing when to do it is a huge part of the equation. Soon you’ll be introduced to sticks that can rotate, allowing you to maneuver them around the grid a full 360° as long as there are no obstacles in their way. You can also use the stick itself to push objects around. 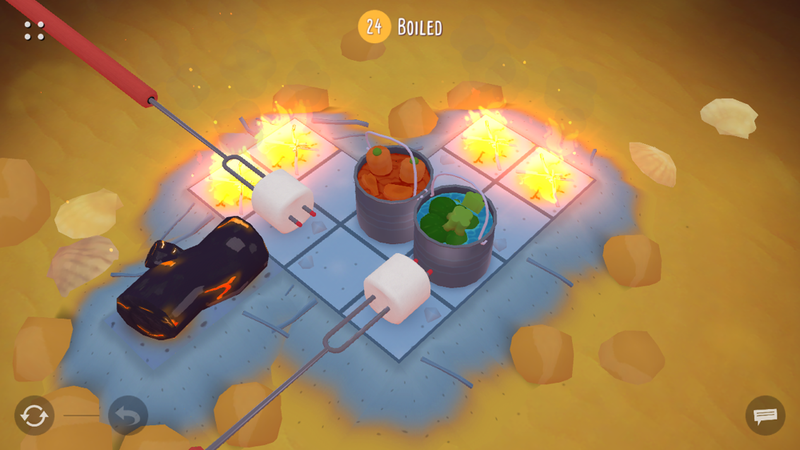 New mechanics are added at a quick pace, from pots of fondue to boil and magnets that can pull them, to flaming burnt marshmallows. There are buttons that turn on stoves and some other little goodies I’ll let you discover for yourself. 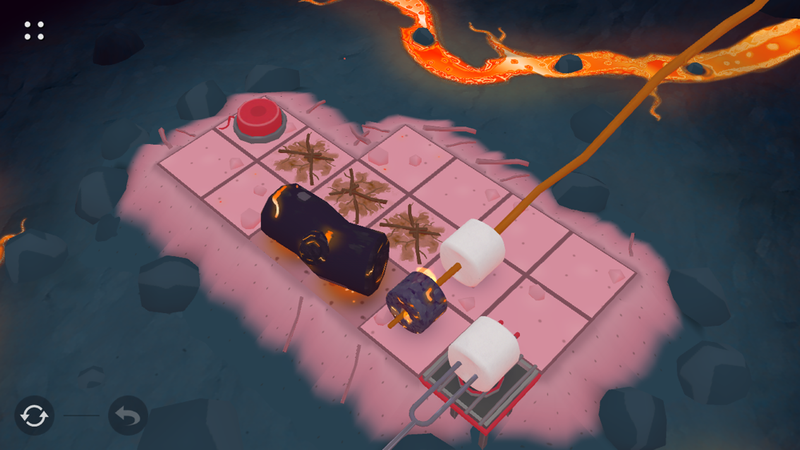 Things get trickiest when multiple mechanics come together in a tight space and you have to figure out how to move things around without burning those marshmallows. It’s not all about stumping you, though. 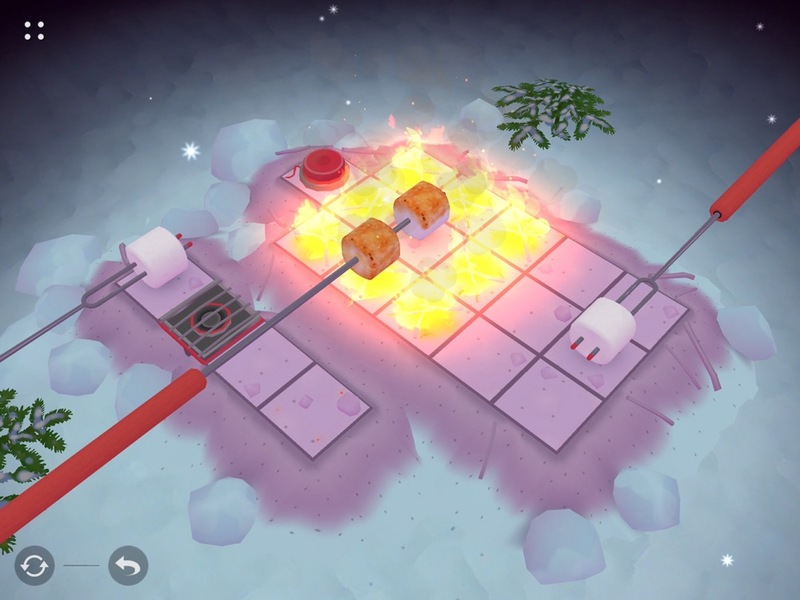 Some levels aren’t that hard to solve but instead are playful, showing off a clever and fun technique using some of the available mechanics. Even when I was moving through puzzles at a fairly brisk pace, all the ideas introduced were new and interesting, so I never felt like my time was being wasted. Rather, it was nice to break up the more difficult puzzles with something light but still cleverly designed. With a hundred levels to get through, this kept me from getting frustrated at any point and giving up. It also helps that, as with his previous games, once you unlock a chapter, you can play the levels in any order. So if you’re stuck on a particular level, try another one. It often helps to take a break from a puzzle and look at it later with fresh eyes. I should also mention there’s a bit of a story in the form of campers chatting around the fire. There are a few cute lines, but the dialogue often fell flat for me. Still, it’s nice to have a small diversion, and there aren’t enough of these cutscenes to get in the way if all you care about are the puzzles. Let’s talk a bit about the controls. I am a big fan of one-handed portrait games that I can play in between doing other things. This is definitely a stray from that, as it’s in landscape mode and meant to be played sitting down, maybe on a couch or even in a tent. It’s also available on PC and feels more like a cross-platform game than one designed specifically for mobile, like Puzzlepops! was. It’s a game that’s a better fit for a nice big iPad than an iPhone. Once you have multiple skewers on the screen and have to deal with both pushing and rotating, the iPhone screen can feel a bit tight. Luckily, there’s an unlimited undo button, so if you do make a mistake it’s not a big deal. But you’ll definitely have a better time with an iPad. If you have two devices, you’ll be happy to know that the game includes flawless iCloud sync, so you don’t have to choose between them. You can play on your nice big iPad at home and on your iPhone while out and about. Despite the controls being a little more complicated than in Puzzlepops!, they’re still very touchscreen-friendly. In fact, I decided to look up some video of Stephen’s Sausage Roll, a PC puzzler that likely inspired this idea, as it’s about pushing sausages around a grill to cook them perfectly. It’s been recommended to me by many, but I don’t enjoy playing games — especially puzzles — chained to my desk. I’d heard enough about it to think of it when I saw the announcement for Campfire Cooking. And yes, there’s some clear inspiration. But what I realized from the video I watched is that Stephen’s Sausage Roll looks far more complex as far as controls go. Instead of just pushing a stick, you have to move a little avatar around the grill and have him use his fork to push around the sausages. This might work fine on PC, but I can’t imagine that working on a touchscreen without tons of mistakes and a whole lot of tedium. So I’m grateful that Layton found a mobile-friendly way to provide a similar idea with simplified controls. Campfire Cooking is another winner from Layton Hawkes. If you’re a puzzle fan, it’s pretty much a no-brainer. Just grab it. Even if it’s not a one-handed game, it’s still a great fit for mobile. As with his previous games, it was designed with the player in mind to be as user-friendly as possible. It’s meant to challenge, not punish you. And the improved 3D graphics make it a more immersive experience. As the weather gets cooler, this is the perfect couch puzzler. Relax with a cup of hot chocolate as you watch the digital flames lick some fluffy white — and pink — marshmallows. 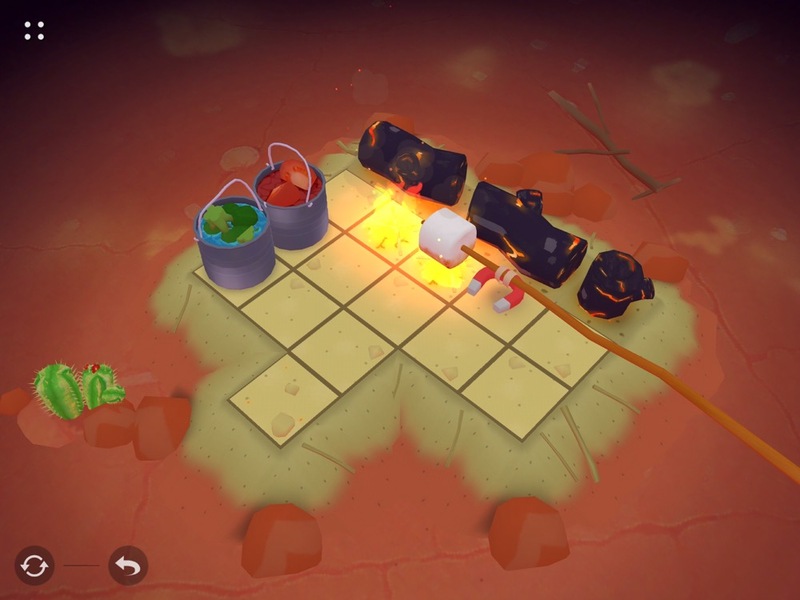 I know this has been an insane month or so with tons of amazing releases, but Campfire Cooking should definitely be part of any puzzle fan’s collection. So stop reading and just download the game here. And if you’re stuck on a level, try my walkthrough guide.